My mother in law gave me a bunch of limes over the weekend while my husband was home for the weekend from the army. I didn't want them to go to waste so I found this recipe on http://www.allrecipes.com/. It looked healthy until I looked at the calories and fat content. The calories came out to be 747 calories per serving and 61 grams of fat which leads to 20 points! I had to do some revamping to the recipe and came up with only 6 points per serving. Now 6 points is how I like it. Also, the recipe states to save the marinade and boil it for about a minute or two and reuse it. I didn't do that since I am nervous about reusing marinade. I did leave the chicken in the marinade for about 8 hours and it already had tons of flavor. 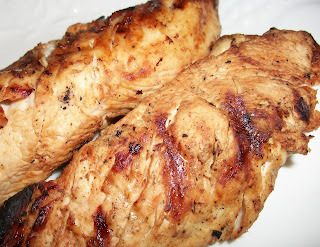 I also cut each chicken breast in half so that they would have more flavor from the marinade. My husband enjoys grilling so I left the chicken with him and I had my break from the kitchen. He absolutely loved this chicken. He is the one that ate most of it but saved me these last two pieces. How sweet of him considering he ate 3 servings but that is okay because it keeps me from going after more! Wash chicken breasts. Pat dry thoroughly. In a small bowl, combine the seasoning salt, ground black pepper and cayenne pepper. Rub the chicken breasts with the spices, then place the chicken into a large, resealable plastic bag. Grill chicken. Brush with the marinade every 15 minutes. Chicken is done when juices run clear.